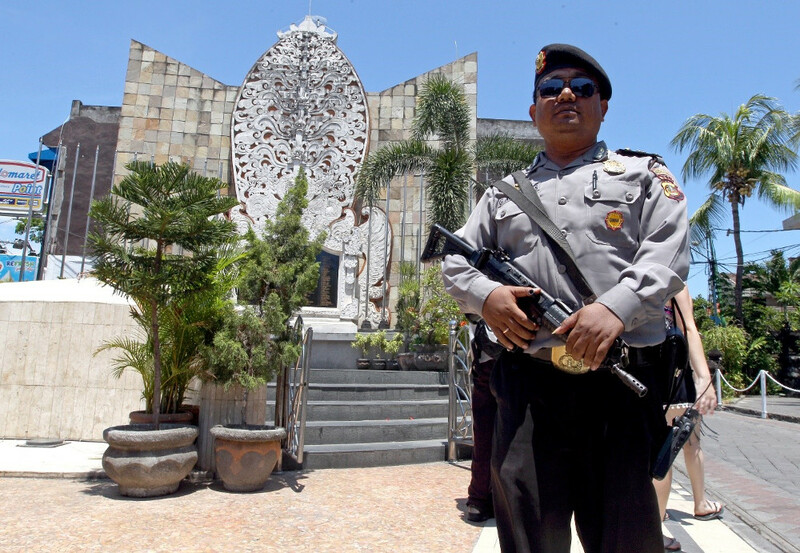 A police officer guards the memorial for victims of the 2002 bombings in Bali, Indonesia, Jan. 15, 2016. Indonesian police arrested a militant who was planning to travel via Iran to join the Islamic State (IS) extremist group in Syria, and once served a six-year prison term for harboring a Bali bomber, authorities said Monday. The police counter-terrorist unit Densus 88 arrested the suspect, Harry Kuncoro (alias Wahyu Nugroho), at Jakarta’s Soekarno-Hatta airport as he was about to board a flight to Iran on Jan. 3, national police spokesman Brig. Gen. Dedi Prasetyo said. Harry is an associate of the late Muhammad Saifuddin (also known as Mohammed Yusop Karim Fais and Abu Walid), an Indonesian militant who was said to be a close aide to IS supreme leader Abu Bakar al-Baghdadi, police said. In late January, the head of Indonesia’s National Counterterrorism Agency (BNPT) confirmed to BenarNews that Saifuddin had been killed in Syria. “HK’s motivation was to join the Abu Walid group in Syria,” said Dedi, using Harry’s initials. Dedi said police waited until there was strong evidence to charge Harry before announcing his arrest on Monday. “The suspect has a long history of terrorism, starting with Jemaah Islamiyah (JI). He has been active since the era of Noordin Mohammad Top,” Dedi told reporters in Jakarta, referring to a Malaysian-born senior JI recruiter who was killed in a standoff with police in the Central Java city of Solo in 2009. JI was the Southeast Asian affiliate of the al-Qaeda terror network. Saifuddin was among three Southeast Asian militants who were labelled last year by the U.S. Treasury Department as “global terrorists” for allegedly recruiting foreign fighters to pledge their allegiance to Abu Bakar al-Baghdadi, whose whereabouts remain unknown. Saifuddin is believed to have been killed while fighting alongside IS militants in Syria in January, according to the National Counter-terrorism Agency (BNPT). Dedi said Saifuddin had invited Harry to come to Syria, and promised to help him with plane tickets and travel documents. Harry allegedly received 30 million rupiah (U.S. $2,137) in cash to travel to Syria, Dedi said. Dedi said Harry was known to have established communication with groups in Syria. Harry was released in 2016 after serving six years in prison after he was found guilty of helping to hide fugitive Bali bomber Dulmatin and smuggling firearms. Dulmatin, who allegedly made the bombs used in the 2002 attack on Bali, was killed in a police raid near Jakarta in 2010. The Bali bombings were the deadliest terrorist attack in Indonesia’s history. While in prison, Harry was said to be close to elderly militant cleric Abu Bakar Bashir, the alleged spiritual leader of the Bali bombers who is still serving a 15-year jail for funding a militant training camp in Aceh. Police said Harry was a “very senior” and dangerous militant. “He was involved in acts of terrorism in Bali, West Nusa Tenggara and the last July 2018 attack. He has been in and out of prison three times,” Dedi said. But a former Jemaah Islamiyah militant who has cooperated with the police, Nasir Abas, said Harry was not an important figure during his time at JI because he was still young. “He was not part of the JI structure. Maybe he was just a supporter,” Nasir told BenarNews. Nasir said there were cases where JI members were influenced by IS ideology while in prison. “Some former JI members are active in ISIS. Some are in Syria and some are joining JAD,” he said, referring to the local IS-linked group Jemaah Ansharut Daulah. The Bali bombings on Oct. 12, 2002, killed 202 people, including 88 Australians, and injured more than 200.